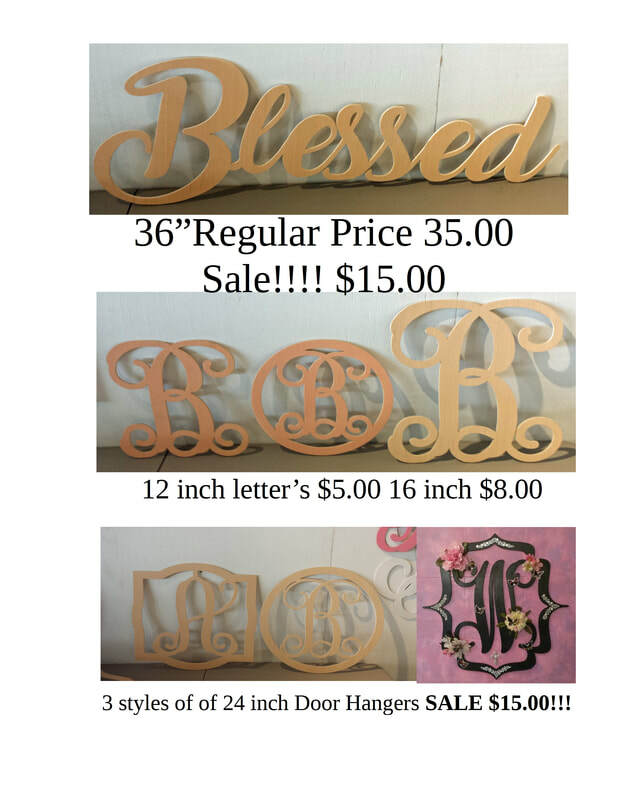 Weekend Mobile Monogram & Sale!! WE had a great weekend at the flea market ! Saw a lot of old customers and talked with many new ones. I have seen several people talk about the market in the negative. Yes there may be a few vendors you might not want to deal with, but a majority are hard working small business people! Frankly is there a perfect place to go shopping any where! So come out and see us!!! Mobile Monogram and Signs!! Traditionally, a married couple’s monogram has the wife’s first name initial on the left, the large last name initial in the middle, and the husband’s first name initial on the right. 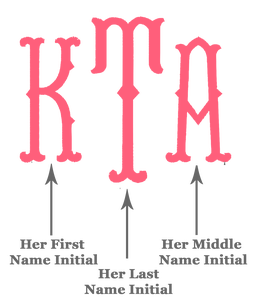 Traditionally, a female monogram consists of the first name initial on the left, the large last name initial in the middle, and the middle name initial on the right. For a married woman, the initial on the right can be her middle name or her maiden name. If you have two middle names, you can either pick one or have both stacked on the right. 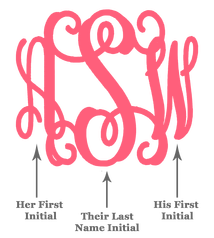 Traditionally, male monograms can mimic female monograms with the first initial on the left, the last name initial in the center and larger than the others, and the middle name initial on the right. However, it is also common to see them all the same size and appearing in name order (first name initial, middle name initial, last name initial). 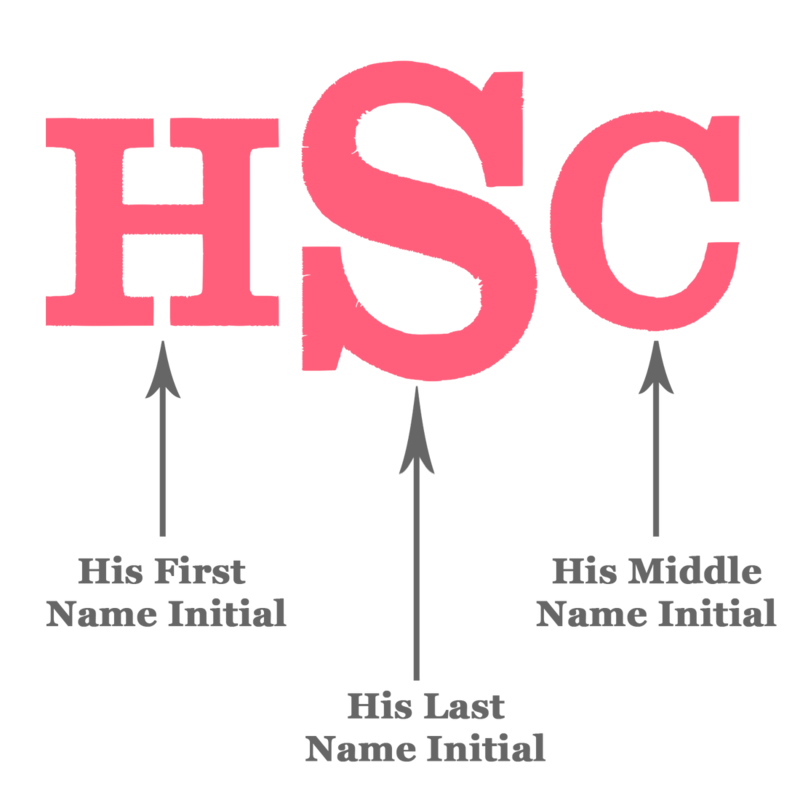 Additionally, men can stack their first and middle name initials on the left with a large last name initial on the right. – Proximity to the road? 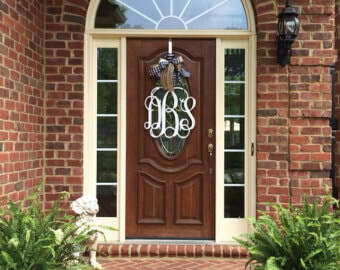 If your home is far away from the road and your front door is under a porch, you might want a larger monogram so it can be seen better. – Put on a wreath or not? If you are going to put your monogram on a wreath, most of those (ivy, grapevine, some other adorable decorative wreaths) come in 24 inch circle options. For that, go with the 18 inch monogram. The first tip you need to know is to measure your space. I know, this takes digging out a tape measure from the garage or that one long measuring tape in an old sewing kit and risking life and limb on a ladder. It is worth it. We measure our wooden monograms by the height of the center initial. In a 3 letter monogram, the width with be about the same as the height, but it depends on your specific monogram. People ask me often, “What size should I get for above my baby’s crib/ living room/ dorm room?”. The answer is, I’m not sure- it all depends on your space! Do you have 12 foot ceilings? Do you have other pictures you’re hanging in that space? The monogram pieces will look the exact same in any size- just larger proportionately the taller they are.